Background: Famous has released this offering, the #Famous as a collaboration with Nestor Plasencia. This marks Famous Smoke Shop’s move into the infused cigar market. 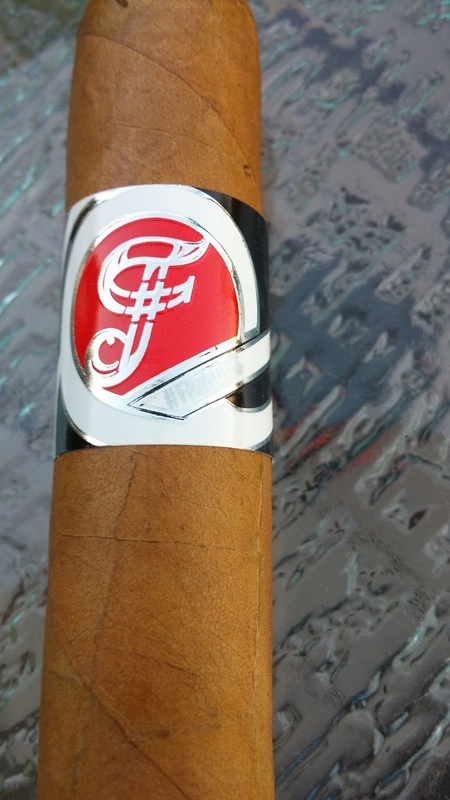 They sell the cigars both in house at their brick and mortar location as well as online. 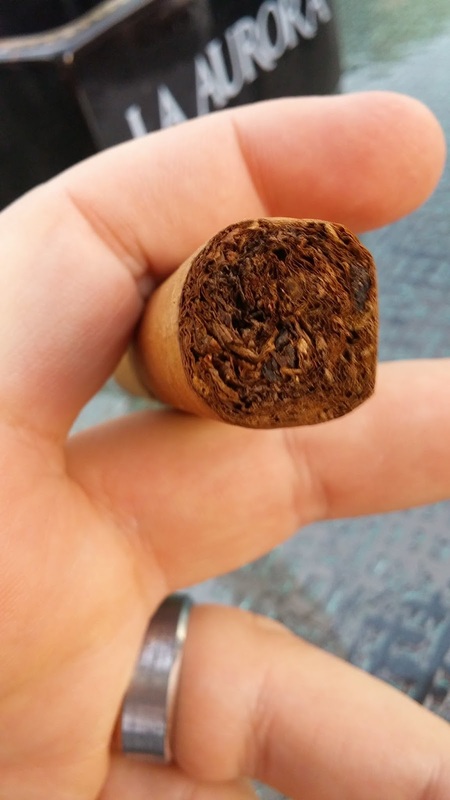 It is listed as a mild smoke with an infused edge to it. Appearance (0-20): A very light natural Connecticut wrapper flanks the outside of this cigar. 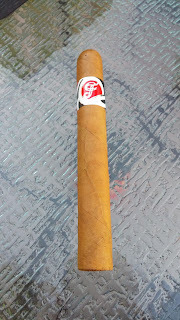 There are a couple of minor physical blemishes that can be seen on it, but nothing of extreme note (tobacco spot, etc). 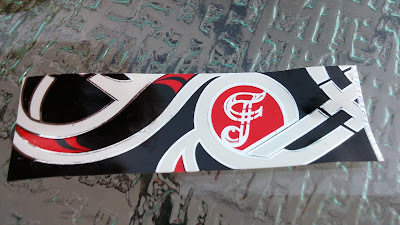 The wrapper is a really neat looking design to it, with the actual “#” being set directly in the center of the Famous “F”. Its centered in a circle that swirls outward. The red and black designs along with silver and white are well done. Construction (0-20): Sadly, where this one looked really good I had some reservations about it. The wrapper was softer (not an issue), but I could feel a few minor dips when pressure was applied that caused me a bit of worry. It felt as if there may be some gaps in the tobacco that would lead to this having some burn issues. Upon cutting, there was a bit of debris, and while it wasn’t excessive it was more than a normal cuts’ amount. The draw was slightly loose, and the burn never suite got to that ideal straight line. It wasn’t terribly out of whack, but enough that it was noticeable. Strength (0-20): Mild. There really is nothing more to say than that, its exactly as it is billed – a completely mild cigar. Flavor (0-20): As I have noted in the past, I actually enjoy flavored or infused cigars. It has just the slightest bit of bitterness like a light coffee. It’s creamy and has a nice vanilla flavor to it. There are some slight derivations of caramel and other small spices, but it’s generally singularly noted. As it smokes down further, the intensity drops slowly. Value (0-20): $4.14 for a single stick isn’t a bad price for the size, but in the same there are a number of other flavored cigars that I would personally opt to spend a little extra on. The value is also slightly decreased due to the construction. 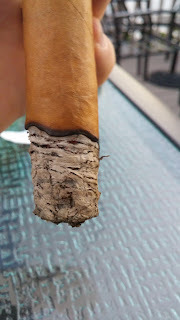 Overall (0-100): I wanted to note, before giving the total overall write-up, that I smoked 3 of these to get this review and had similar results with each. So this really is a conglomeration of all of three of them. This is Famous Smoke Shop’s first foray into production of flavored / infused cigars, so it’s not too much of a surprise that it has some smaller missteps. The construction could absolutely use some work since it feels like it could have been produced / wrapped a bit better. The packing was loose at points, which affected the draw and burn, and the cut wasn’t clean. The complexity also wasn’t quite there, but then again it doesn’t always need to be complex. Flavorwise, it’s a pleasing taste of something akin to a coffee with some vanilla caramel coffeemate poured into it. But that being said, it is less sweet than some of the other alternatives on the market. On the positive side of things – the branding is outstanding and the strength is dead on for where it was being marketed. Is this the sign of things to come? Famous put on its water wingies and got into the shallow side of the pool with this offering. And that itself is a big thing since it’s a new market for them. And this isn’t too shabby for a first try. I personally think this is a decent smoke for the price, but not one that knocked my socks off. I actually do look forward to see if they do something more with flavored lines in the future, and perhaps improve on this first step. Will they make it to the deep end of the pool? Time will tell. But for now, this one is worth a whirl as a flavored alternative.